I discovered the problem by using the OnBlur? event of a Datagrid, but it can occured for any widget. On Internet Explorer, the OnBlur? 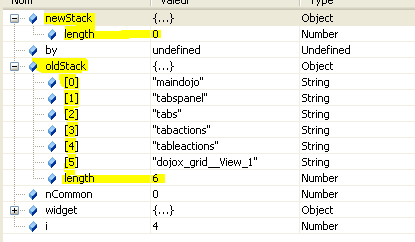 event trigger each time you click in a cell of a Datagrid, and not only when you leave the table. The problem does not happend on Firefox, as the treatment is different (see below). The code is thinking that we clicked "outside", so it sends OnBlur? events to all the active widgets ! In my case, this leads to a disaster in my code. I tried various options, but the simplest one was to put into comment the (*this line*) line. This solved the problem and make the onBlur event worked normally for me. I am quite new on Dojo, and I don't know what could be the side effects of not treating the "body onactivate" event. I hope this help ;-). Please give me a feedback. testblur.htm​ (7.2 KB) - added by Eric Pasquier 9 years ago. testMenuBug.html​ (2.7 KB) - added by chrisbay 9 years ago. Hi Eric, thanks for the detailed description. Does this reproduce with the standard grid test files? Actually, can you attach a test case? You are saying that clicking on a grid cell causing an onactivate event where evt.srcElement is the document? I'm not sure why that would be, that event usually reports the actual element, even if the clicked element isn't focusable. For example, clicking the up/down arrows on a NumberSpinner widget. Hi Bill, Please find a complete test. I put a grid inside a few containers and attached a console message to each blur event. Play with the grid by clicking/double-clicking on different rows and outside the grid. Try with Firefox and Internet Explorer. With FF, the blur event is triggered only when you click outside the grid (it is connected directly and working well). On IE, you can see a "nested fire" of events when you click in different rows and outside the grid. Note that my patch, commenting the (*line*) do not solve completly the problem, but at least invert the "isEditing" state when you click outside the grid, which solved my problems. It seems that you have better knowledge than me to understand why it has been implemented this way and what should be done to correct it. I hope this help. Eric. Hi Eric, thanks for the test case. I'm seeing the problem when you double click to edit a cell, but not on single clicking. Is that what you are seeing? Probably it's a problem where Grid blurs the focused cell before focusing the new cell (the <input> for editing). No, you are right. The problems occurs only with double-click with the original code. It happends on single click only with the modification I have done, confirming that the case is not so easy to solve. <<Probably it's a problem where Grid blurs the focused cell before focusing the new cell (the <input> for editing).>> It seems that it blurs the current cell, as you can see "IsEditing?=true"; but it shouldn't do this as it *enters* in Edit mode, and anyway, shouldn't blur all the stack. I did not make any further investigation, but I wonder if this is happening with any other widget ? Or is it possible for the grid to break the stack ? is there any call to _setstack or indirect event generated from the grid ? Should not be too difficult to trace, but its true that the stack calls is quite long. These last lines (dgu.fire) are quite obscur for me, and generate the 'onactivate body' event. I mistyped my previous comment, I said "cell" but actually meant node (ie, DOMNode). Specifically, the focus is originally on a <td> (the readonly version of the cell), but when the user double-clicks, that (original) <td> is orphaned (not sure why), an <input> is created (and apparently, a new <td> to contain it), and focus is moved to the <input>. Probably the <td> has focus when it's orphaned. When a node with focus is orphaned (or hidden), where does focus go? I think on IE it goes to <body>. So I suspect focus is momentarily moving to <body> and then being moved to the <input>. I might be able to work around this in the dijit focus code but from what we've seen in dijit many times (especially with InlineEditBox), bad things happen when the focused node is hidden, so it would be better to redesign Grid to not do that. The code you quoted above is obscure for me too :-) but I don't think they are the problem per se... I'm sticking with my theory above. <<it would be better to redesign Grid to not do that. >> If you make some change, what about using a State transition Table to eliminate all these "settimeout" ? Eric. Can I help doing something ? Patches are always welcome (if you've signed the CLA), I don't know the grid editing code at all so I can't say more than that. Not sure what a state transition table has to do with anything. I have seen this issue in another setting: when a popup is closed and it's wrapper is hidden. I have a test case (which I will attach) that shows the problem with a dijit.form.DropDownButton? containing a menu with a popup menu item. It seems to be only an IE issue. Apparently, when the popup menu closes the wrapper has the focus, which is then transferred to the body and the same behavior that Eric describes occurs. The widget stack containing the button, menu, menu item, etc. is cleared and the drop down closes. Thanks for the test case; I think the Menu problem is a different problem, a race condition regarding mousing off of the PopupMenuItem before the submenu has had a chance to display etc. I filed a separate ticket #10546 to track it. We'll leave this ticket for the Grid problem. Any news for this ticket ? I have to patch the source code on each release to have my code work. Eric. The main default, ie the isEditing status of the grid, is corrected, may be due to an upgrade of IE (because the bug is not present anylonger even with previous 1.4.x versions) The grid is still raising Blur events when you enter into the Edit mode, but it is not so important as the isEditing status is now correct. Nope, the bug is stil there in 1.4.3, 1.5.0 and 1.6.0. Every time user starts editing in a cell, IE fires onBlur event, which makes it impossible to submit changes in the last edited cell after focus actually leaves the grid.